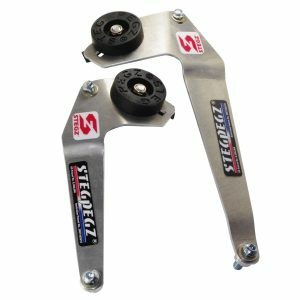 Steg Pegz are a revolutionary concept which allows you to grip and control with you legs not just your arms. Reduce arm-pump and fatigue. 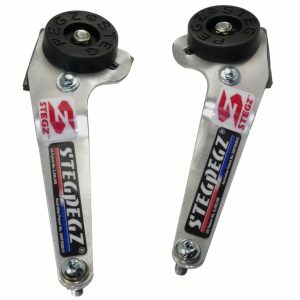 Steg Pegz® are designed to Grip the calf area of the boot. 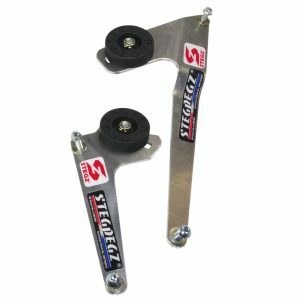 The whole idea behind the Steg Pegz® is to give the rider some support at the legs to keep his/hers body weight from going backwards when standing up under acceleration, in turn taking the weight off the hands/arms to reduce arm-pump and fatigue. 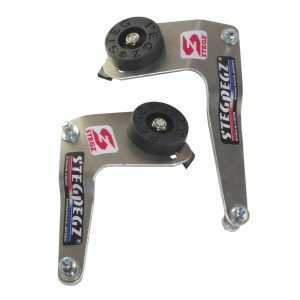 The key feature of the Steg Pegz® is the rubber puck. 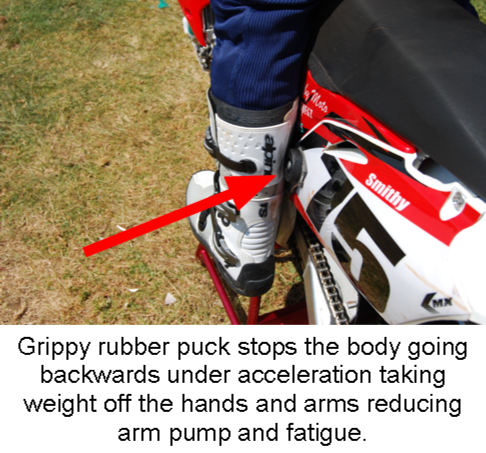 Using rubber has a huge advantage of giving outstanding grip while keeping a lower profile which gives you the availability to still move about on the bike when needed. 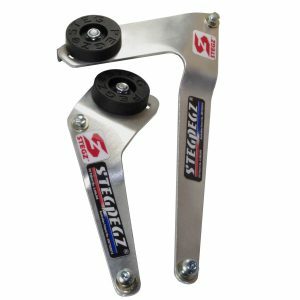 “StegPegz allow me to use my legs a lot more to control the bike which makes it easier on my arms. 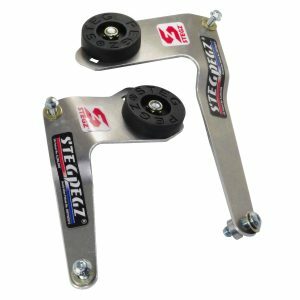 I’ve used StegPegz in every Finke I’ve won and I can’t imagine riding there without them. I’d need to back off the throttle at some stage to rest my arms if I wasn’t using them. 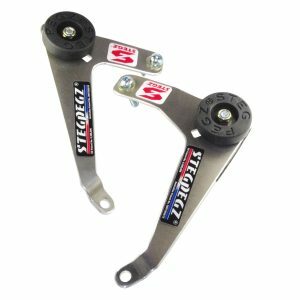 StegPegz let me go as fast as I want for the entire race” – Ben Grabham – Factory Motorex KTM 4x Finke Desert Race Champion. Factory Motorex KTM off-road Riders (Finke, Hattah racing). Factory Honda GHR off-road team. Factory Husqvarna Rider Glenn Kearney. 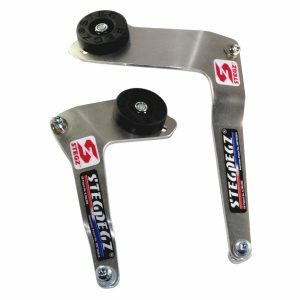 Steg Pegz are imported from Australia by Brap Offroad. 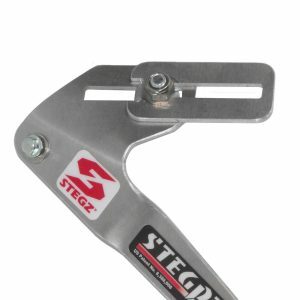 Steg Pegz bolt to your bike and are designed to take pressure off your arms. CONTACT? www.brappowersports.com or (717) 285-7873. WHAT STANDS OUT? 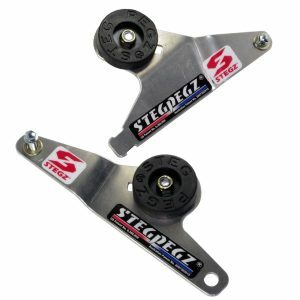 Here’s a list of things that stand out with the Steg Pegz. (1) Concept. 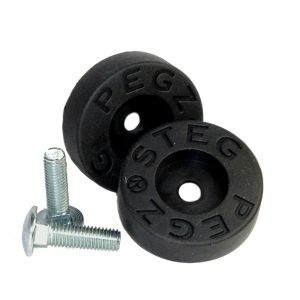 Steg Pegz are rubber pucks that look like skateboard wheels. They attach to your bike’s side panels. 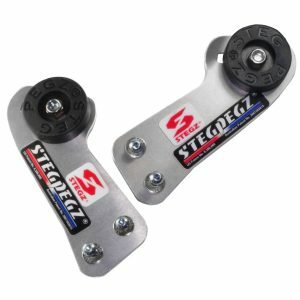 Steg Pegz’s rubber pucks are designed to allow the rider to rest his boots against the pucks so that he doesn’t have to hang on to the handlebars as tightly. 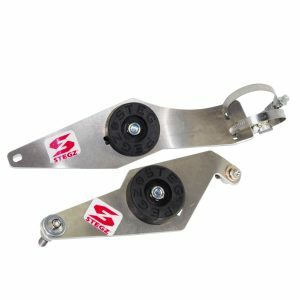 In theory, this should keep your body forward on the bike under acceleration without having to use much upper-body strength. (2) Installation. 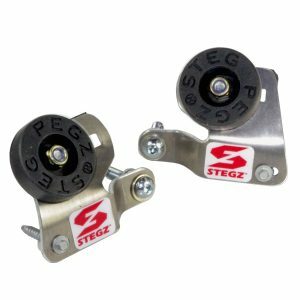 Steg Pegz are made for every major brand, and they come with the necessary mounting hardware and bolt into already existing holes. (3) Adjustment. 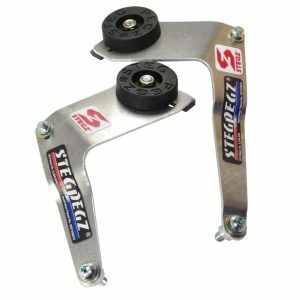 The Steg Pegz are completely adjustable. The rubber pucks can be moved back and forth in a slot. We recommend starting with the pucks in the middle of the slot. During the first few rides, you will want to move the pucks all the way back, as they feel foreign. But, stick with the middle position, because the more you ride with them, the more adept you will become at using them. Leg length, riding style and personal preference play a big role in where to position the pucks. 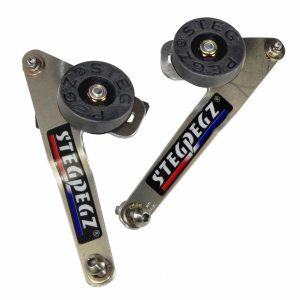 Steg Pegz sells an extension for more forward adjustability for $29.99. (4) Performance. 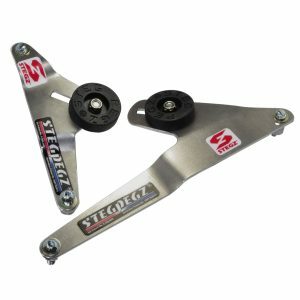 We will admit that the first time we rode with the Steg Pegz we were uncomfortable. But the more we rode, the more we liked them. 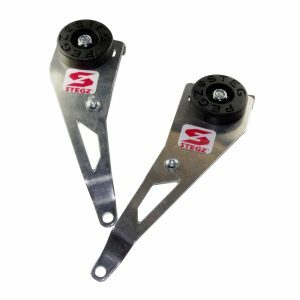 When you use them correctly, you are able to take weight off your arms under acceleration. In fact, several test riders wanted thicker pucks so that they could find them easier. Initially, we feared that our boots might get caught on the pucks. 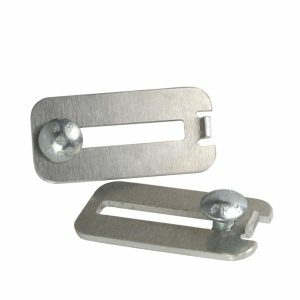 One tester got his pants momentarily stuck on the exposed 8mm hex-head bolt, but a button-head Allen bolt solved that issue. (5) Wear. We actually wore the edges off the pucks—much like rounding off the knobs on a tire. Replacement pucks are $39.99. 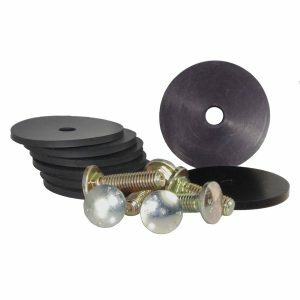 We think that the average rider could get a year’s use out of the pucks before having to replace them. WHAT’S THE SQUAWK? Two quibbles. 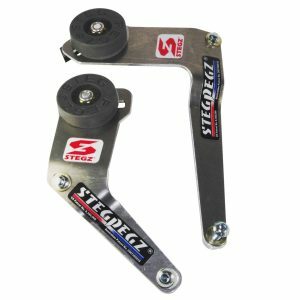 (1) We want Steg Pegz to offer different thicknesses of pucks. (2) They should change the head bolt to something rounded so there is less of a chance of getting hooked on it. 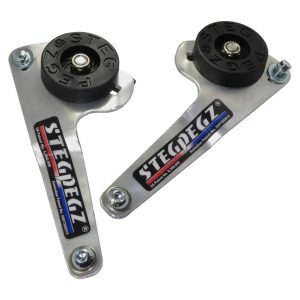 The Steg Pegz did exactly what they were designed to do. And, yes, we were surprised!